One of the ways we can ensure our loved ones are taken care of when we die is to make a last will and testament. Find out more about sample Wills here. Directly write your own Health Care Proxy here with no need to hire a lawyer. . . . . Read More. . .
Do you have a Will, Health Care Proxy, Power of Attorney or Trust? If you answered no or don't think you need it, THINK AGAIN. Watch this video of Estate Planning Attorney, Harry Scaramella, presenting Estate Planning 101. In this video, Harry explains the real reason you should have a Will, Health Care Proxy, Power of Attorney and/or Trust Planning. You do this for your family so they don't have to make life or death decisions at an emotional time in YOUR life. These documents keep you in control at a time when you might not be able to communicate your own decision to either your personal health care professionals, EMT's or what if... out of state emergency situations. You create the documents personalized to your life style, your thoughts and your wishes.You choose who can act on your behalf and most importantly, who can't! Keep your life, your health and your wealth exactly where you want it and who can access it if you can't whether for a short period of time or a long time. Watch Estate Planning Attorney, Harry Scaramella, explain and educate in a way you will find easy to understand and remember. We hope you watch Estate Planning 101 and get motivated whether you live in Utica, NY, Syracuse, NY, Rochester, NY, Buffalo, NY or anywhere in between, they can help! Their attorney travels to you to meet in the comfort and privacy of your home or your advisor's office. Everyone has an estate, it's called your stuff! Don't pre-judge your estate. Check out their website at www.lifelawllc.com to protect your personal property today! Nobody likes to think about the day when they'll finally pass away. However, it's an inevitable occurrence for all humans. One day, each and every one of us will die and we must think about those who survive us. Are those people going to be taken care of? One of the ways we can ensure our loved ones are taken care of when we die is to make a last will and testament. If you don't want to pay attorney's fees in order to make a will, you can design a simple will yourself. You may, however, wish to find sample wills to copy the format so that yours is thorough and professional. You don't want to leave anything out and you want to make sure everyone close to you gets something from your estate. Therefore, it pays to see some sample wills when making your own. There are several computer programs that will provide sample wills. These are basically templates that will help you design your own will. They will give you tips on how to divvy up your estate amongst your surviving family when you have finally passed away. These computer programs are fairly inexpensive, especially when you consider all that you're saving by not going to a lawyer to draft your sample will. You can also go to the internet to find wills online and sample wills. The internet is where you can find all kinds of information regarding wills and how to create a simple will. You can find tips on how to make people feel as though they're getting a fair cut of your belongings. It's tough to think about who should get what (bequests), and it's unfortunate that too many families fight over the ways estates are split up, but this needs to be thought about while you're still healthy so that you're prepared when that day comes. So login and find some sample wills and create your own living will so that your children and the rest of your surviving family are well taken care of when you're not around to provide for them. Finally, there are many books on how to create your own last will and testament and these books will also contain sample wills, living trust and living will forms free. It's important to see several sample wills so that you can design one that fits your needs. Some people may have more to their estate than others so it's important to find a sample will that is comparable to your situation. Many of these books provide sample wills just like that so pick a few up and create the perfect last will and testament. By looking at sample wills, you can make sure you don't leave anything out and you can also save money on attorney's fees, which will put more in the pocket of those you love when your will is finally read aloud after you're gone. Free Wills to Print provides detailed information on Free Wills, How to Write a Will, Bequests, Last Will And Testament, Simple Will, Living Will and more. What is Durable Power of Attorney? How Can I Add to an Existing Will? Can I Inherit from a Will Early? What is the Definition of an Heir? Why Should I Use a Living Trust? 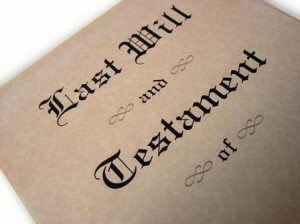 ◦ Contesting Last Will And Testament The Right Thing To Do? Copyright © 2008-2019 FreeWillsToPrint.com. All Right Reserved.